Last term in Extension, we did the 40 hour famine. Because of this, we explored all kinds of things that people who lived in poor parts of the world use for work, cooking and all kinds of stuff. I combined two of the tools that I saw some people used. A water bucket and a mortar and pestle. Here's what it would look like and how it would be presented. Our class task was to find a very unique sport that we and our class mates haven't heard of. We had to research all about that certain sport and create a presentation or movie to show what we know about our game and possibly show teach people how to play it. Jorja and I decided to make a movie. Along with a few of our class friends, we filmed and animated our own clips for this short movie. It's nothing special but we managed to explain our sport quite well. Enjoy! This Thursday, the extension team are attending the Storylines Festival. Similar to last year, we are going to be hearing from some authors. Many of the authors this year are New Zealanders which is really cool. Juliette MacIver is a children's book author who grew up in Wellington. She went to Victoria University where she received a degree in Linguistics. Juliette had various jobs; teaching English, working as a tour guide, travel agent and a few more. She has written a total of twelve books and is quite well-known for one of them, Toucan Can. Born in Auckland, Catherine Mayo is a Young Adult writer. Not only that but she is currently in a band named Gentle Annie. She has written only two books, Murder in Mykenai and The Bow. Out of all the authors, I'm looking forward to listening to Jill MacGregor. Although she was born in Dunedin, she spent a reasonable amount of traveling through the Pacific Islands. For two years, she worked as a VSA teacher in Tonga. Because of this, she writes Pacifica Books, four of them being about Tonga. Paula Green seems to be the only poet who is attending the festival. Only a few of her stuff are children books but most of the things she has written are poetry collections. She is also a reviewer, anthologist and book-award judge teacher. Ms Green also has a PHD in Italian from the University of Auckland. So as you can probably tell, there are a lot of things to look forward to at the Storylines Festival. I definitely have some questions for these authors and I can't wait to ask them personally. As preadolescences, we are very vulnerable to drugs and alcohol so as a way to prevent us from choosing the wrong path, Team 5 took Life Education sessions to learn the effects of drugs and what damages it can do to your body and most importantly: your brain. We listened to real people's experiences with drugs and most of the victims first started out with glue and Marijuana. Marijuana is a hazardous substance that is well known for being the gateway drug. Easily attainable, cheap and addictive, Marijuana, also known as pot, weed or tinnie, leads people into a web of addiction. Under the influence of marijuana, people can have bad memories and have trouble with decision making; separating what’s right from wrong. This totally changes the way the brain works and stops it from reaching it’s full potential. During class, we were given a task of creating our own mascot after we examined Glasgow's commonwealth mascot, Clyde. We had looked at the other mascots like Shera the Tiger, the Olympics mascots and of course, like I said, Clyde the Thistle. This inspired us to come up with our very own mascots. We imagined what mascot would represent New Zealand if we held the next commonwealth games. I had a hard time trying to name my mascot. I tried to think about what things made New Zealand significant and what represented it well. So I decided to name my pukeko, Kapua. Kapua means cloud and New Zealand is known as the Land of the Long White Cloud. 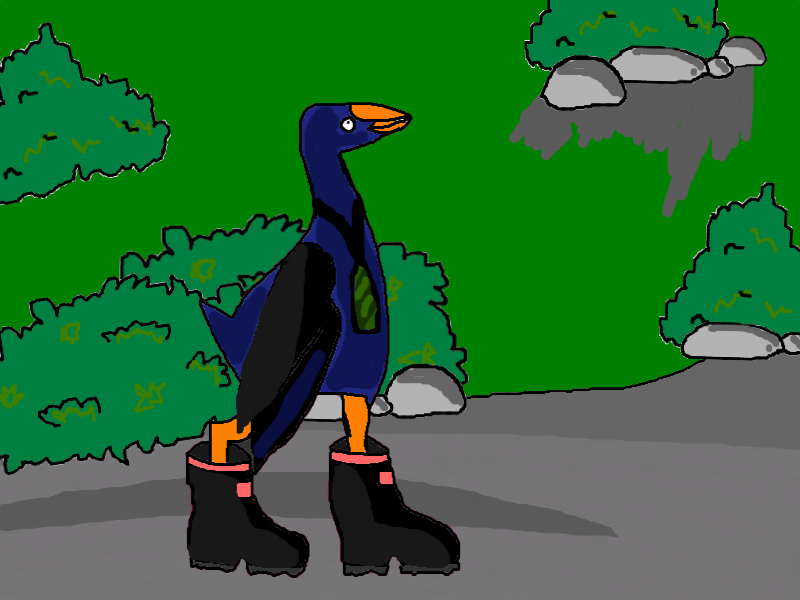 With my pukeko, I drew gumboots and a greenstone. Those two things are both apart of kiwiana (New Zealand icons). Kapua is a great hiker and he also love running. He helps the sheep dogs gather the flock and kine at farms. The commonwealth will find itself with amazing luck when Kapua is representing New Zealand. Kaycee and I tried our best to play the game everyday but found ourselves having difficulties with the game especially when we were nearly finished. We played it on Wednesday and Thursday, trying to figure out what was wrong. That was until our teacher told us, everyone else was having the same problem and it was a bug. Luckily, today they fixed the bug and now we are going to finish it. But we did some interesting things on Wednesday. We hoped on and realized we had completed all the parts on the game except the Courtroom. So we presented our idea to the council and out of 4 ways to stop the asteroid, we picked the Solar Sail. We believed it was safer than the other options because it resulted in less deaths, the idea of it sounded more effective and we trusted the information we were given about this subject. After we put in our option, we had to provide some evidence on why we wanted to use the Solar Sail. Not only that but we also had to put in reasons why we didn't pick the other options. Kaycee and I soon finished the game after we were given a hyperlink to where the game wasn't buggy. The solar sail proved to be very very effective and didn't kill anyone at all. The game wasn't that difficult, we were pretty happy with our outcome. I do wish it was longer and had more tasks to complete before going to the council. Other than that, I really liked the game. Extension got the privilege of being the first class in New Zealand to try out a new game that was developed by a group of people from Auckland University. We had to take a quick test first before getting into pairs and starting the game together. Kaycee and I played the game together and we found many interesting things about the game. 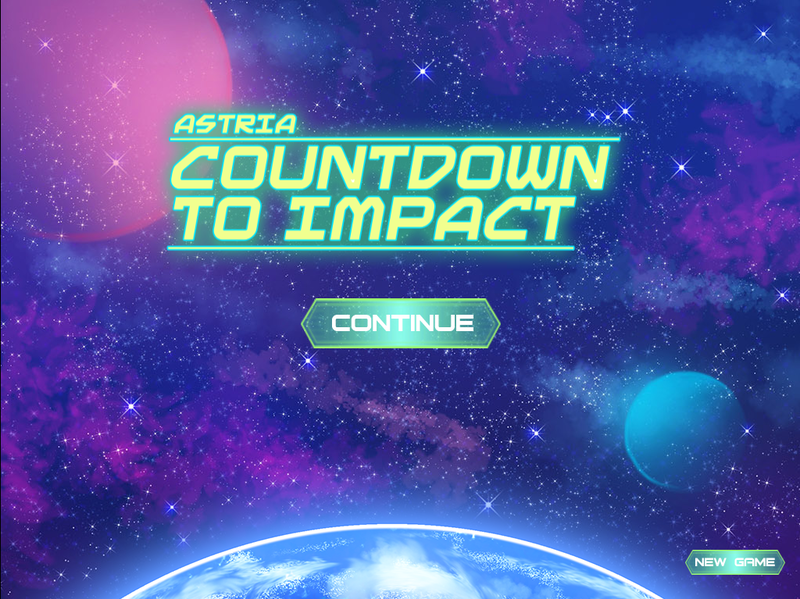 Basically, you are a Alpha Leader in the future who is trying to find a way to prevent an astroid from hitting your planet (Astria). You go through a series of challenges and puzzles that you have to figure out. I found that the hardest part of the game was talking to the right people to find the right information. Not only that but also we had to rate whether a piece of information was trustworthy or not. Today, my partner and I managed to complete 4 zones in the game. I think we could be close to completing all of the tasks and presenting the final presentation. We got a lot of information already and are on the right track to finishing the game. I'm excited to see where the game will go, especially the story.